When it comes to sewer overflows, water does not discriminate. So, big city or small city, infrastructure planners need to deal with overflows just the same. One common approach to dealing with sewer overflows is by adding capacity through the construction of large-diameter deep tunnels to store excess flows during wet weather events. When the rain stops and flows in the sewers recede, water is then pumped from the storage tunnel back into the system and treated. Chicago’s Tunnel and Reservoir Plan (TARP) pioneered this approach with a deep tunnel system that began construction in the 1970s. One of the most recent adopters of the approach is Lorain, Ohio. With a population of approximately 65,000, Lorain is much smaller than its Great Lakes cousin to the west, but it shares the same need to protect its local waterways from the effects of pollution. City planners, working with consultants Arcadis and NTH, developed the deep tunnel approach – known locally as the “Big Dig” – to eliminate sanitary overflows to the Black River and Lake Erie. It differs from TARP and other schemes in that it is designed to eliminate inflow-and-infiltration induced sanitary sewer overflows (SSOs) as opposed to combined sewer overflows (CSOs), which comprise a mixture of stormwater and sanitary flows. The Lorain Back River Tunnel was the result of an Ohio EPA order in 2000 to address overflows that violated the City’s National Pollutant Discharge Elimination System (NPDES) permit. After studying options, including the construction of an equalization basin in downtown Lorain, a deep tunnel option was selected. The tunnel is being constructed with the assistance of loans from the Water Pollution Control Loan Fund through Ohio EPA’s Division of Environmental and Financial Assistance. A joint venture of Walsh, Chicago, and Super Excavators, Menomonee Falls, Wis., was the low bidder for the project with a bid of $52,000,243. Electrical work bid under a separate contract brings the total construction bid price to $55.4 million. The major components of the black River Tunnel include the construction of a launch shaft and reception shaft – approximately 36 ft in diameter and 165 ft deep – and a 5,500-ft tunnel with a finished diameter of 19 ft. Ric-Man Construction was subcontracted to build the shafts. The project route runs along city property roughly parallel to the Black River, beginning at the launch shaft near the Black River Wharf and terminating near the Lorain Black River Wastewater Treatment Plant. A screening facility will be built at one end near the wastewater treatment plant, where water will be diverted into the storage tunnel, and a pump station will be constructed at the launch shaft site. When complete, the pump station will move water from the storage tunnel back into an existing sewer interceptor. The tunnel will be driven primarily through shale, although a buried valley of soft-ground material is expected near the end of the drive. Notice to proceed was issued in August 2012. 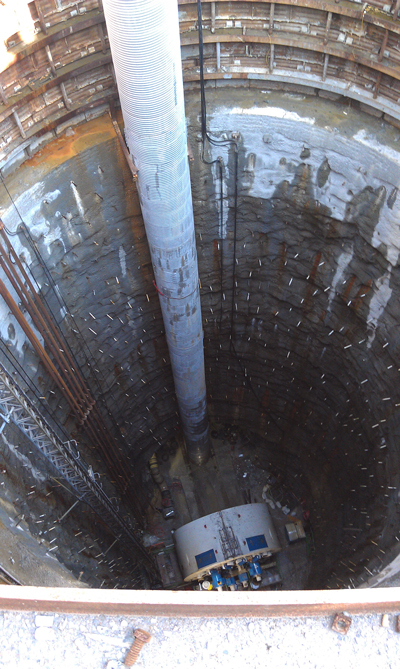 The launch shaft was completed in April 2013 and the starter tunnel completed in August as crews began preparing for the arrival of the tunnel boring machine. 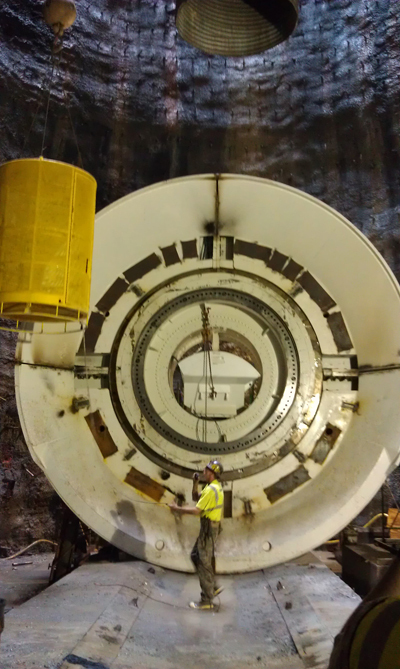 Crews are using a refurbished Robbins double-shield TBM with a new cutterhead. The machine, which was shipped from Italy, was refurbished and put together using Robbins’ “Onsite First Time Assembly (OFTA)” method. By using this approach, as opposed to the more traditional approach of assembling the TBM in the factory and testing prior to shipment, Walsh/Super Excavators was able to save valuable time. According to The Robbins Company, the Black River Tunnel project marks the first use of this approach in the United States, although it has been used elsewhere globally with success. 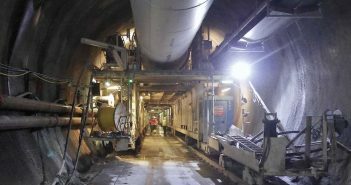 “We are expecting to save at least a few weeks off the schedule by using the OFTA approach,” tunnel supervisor Gregg Rehak said. Using the OFTA approach, individual pieces are tested prior to delivery but the machine is never fully assembled. Onsite, Robbins’ technicians work with the contract to assemble the machine and provide support as needed. 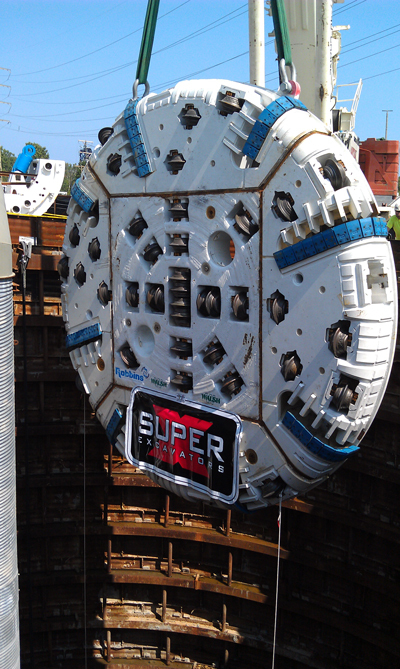 The nearly 200-ft long TBM features a 23-ft ID, 232,000-lb cutterhead that was lowered into the hole on Aug. 20 with the help of a 500-ton crane provided by Capital City Crane just for the occasion. 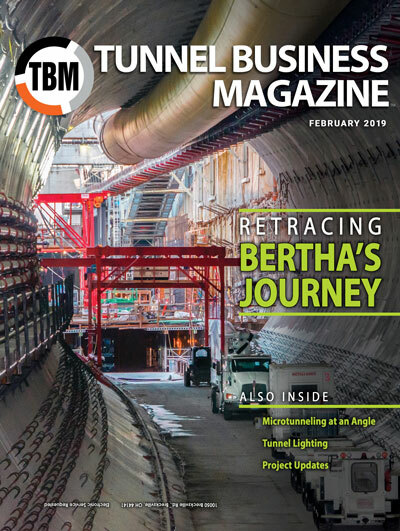 The rib-and-board starter tunnel was built to a length of 200 ft so that mining can begin in full production mode when the machine is assembled, Rehak said. A continuous conveyor will be used to transport the muck. Because of the potentially gassy shale and the rib-and-board initial liner, Trolex gas monitors will be installed every 500 ft to ensure the safety of workers. Crews will also be using a Tacs guidance system to help maintain the 0.2 percent uphill grade. Mining is expected to be completed to be completed by spring 2014 final project completion set for 2015. 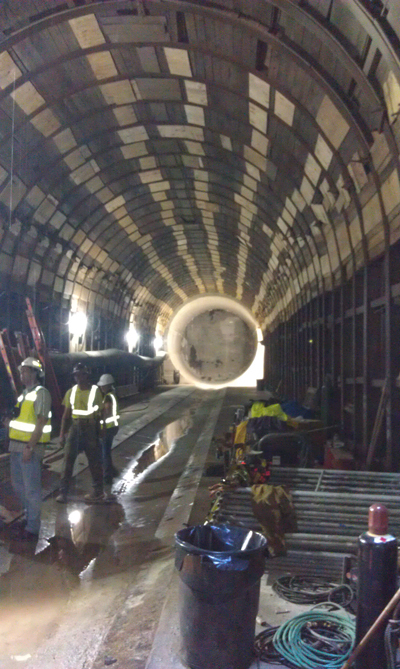 When finished the tunnel will have a storage capacity of 11 mgd, providing a big water quality benefit for a small town.